No one knows for certain what exactly will be announced at Apple's semi-exclusive, invitation-only event in San Francisco next week. But a lot of us are thinking it will be the unveiling of an Apple tablet. Here's why you should care. Apple has finally woken up to the potential and fiscal importance of gaming on the iPhone. Nowadays their popular smartphone, and the iPod Touch, are both marketed as gaming devices. 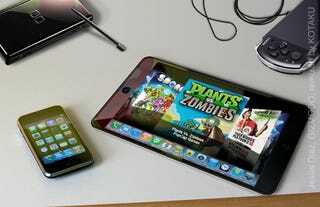 The tablet would be a great way for Apple to extend their reach into gaming. This morning the Wall Street Journal reported that Apple is actively working with Electronic Arts to show off the device's gaming capabilities. And let's not forget that several gaming sites, including Kotaku, have been invited to the big show on Jan. 27. I think we can all agree that gaming is most certainly going to be a part of the tablet's future. But how big a part? That depends on a lot of variables. The biggest, unfortunately, is the guts of the device itself. Will the tablet be a glorified iPhone or a stripped down laptop? Even if the tablet doesn't have much more processing power than the iPhone 3GS, that doesn't mean there can't be interesting games for the device. The iPhone 3GS brought with it beefier graphics processing which allows for faster framerates, and better shading. It also includes a faster CPU and more memory. Most importantly, there aren't a lot of games pushing the 3GS to its limits yet. I'd be surprised if the tablet didn't have some sort of step up, perhaps a major one, from the iPhone 3GS' muscle power, and there are a couple of other interesting things that the tablet could be bringing to portable gaming too. There are the rumors of a built-in camera, built-in WiFi and 3G and new tech that would allow Apple to create a more accurate and thinner touch screen. Of course all of this would be running on a much larger screen, thought to be 7 to 11 inches, compared to the iPhone's measly 3.7-inch screen. All of that will come with a price, ballparked between $700 and $1,000. Sure, that's pricey, but considering people were paying $400 for the original iPhones, I don't think it will be a deal breaker for a massive group of early adopters. The tablet will most certainly not be just a gaming device, with publications reporting that it will be an e-reader for magazines, books and text books. And I'm sure it will include broader apps and iTunes music and videos at the bare minimum. But what sort of games could we see on the device? And with a strong possibility of no physical controller, no mouse or keyboard, what sort would we want to see on the device? The most obvious types of games we'll see on the tablet will likely be ports or remakes of games that worked well on the iPhone. Sure, the device is bigger, perhaps so big that you couldn't hold it and play as you stand around, but I think there are plenty of games that could make the leap. Besides Apple needs to show off some games during their unveiling. Plants Vs. Zombies, which keeps getting pushed back and is now due to hit the iPhone within a week of the Apple press conference, seems like a fantastic fit. The larger screen and table-top play are great additions to the game and could resolve the only concerns I have about an iPhone port of this tower defense title. Ubisoft seems to be getting more and more interested in growing their mobile gaming market, in particular the iPhone market. So I wouldn't be too surprised to see some of them up on stage with EA at some point showing off games. They've already shown a willingness to experiment with controls for the iPhone, that's the sort of development that will be necessary to help the tablet succeed in the realm of gaming. And why stop with ports of handheld games? We've seen R.U.S.E played on a a surface computer. I'm not sure if the tablet would have the processing power to run this Ubisoft strategy title, but if it did I couldn't think of a better fit. Another big player will be Electronic Arts, but what can we expect from them? Both the upcoming Tiger Woods game and a Madden port seem like the sort of big-name, mainstream titles that Apple would love to see on a new gaming platform. And both the Sims and Spore would be solid fits. Which EA Games Can We Expect To See On Apple&apos;s Tablet? Besides the obvious, there will have to be at least one surprising title, something created from the ground up for the tablet. A game that uses whatever new tech is packed into the device to prove that it can hold its own in gaming. While the iPhone's poster boy for gaming seemed to be Trism early on, I don't see Apple giving that away to a third-party developer this time. This is going to be a game developed internally, I think. Looking over the roster of people Apple has hired over the past year, folks like former Ensemble Studios developer Graeme Devine, I personally think it's going to be big. Devine's most current expertise is real-time strategy, the last two games he worked on were Halo Wars and Age of Empires 3. Though he started out working on groundbreaking adventure games like The 7th Guest. If Devine, whose current job title at Apple is listed as iPhone Game Technologies, is working on an internal game for the tablet, I'd like to think that it's a real-time strategy title. Something that would allow you to control battles and build civilizations from a top-down perspective with zoom-in and touch control capabilities. Whatever happens next week, its most likely going to involve gaming and Apple's increased interest in the industry can only lead to more expansion and, I'd hope, more innovation all around. Make sure to join us Jan. 27 for our live coverage from the event.